If you love skiing, then you know how fast your hands can get cold or even freeze. The cold could also cause injuries such as frostbite or dry your hands skin. 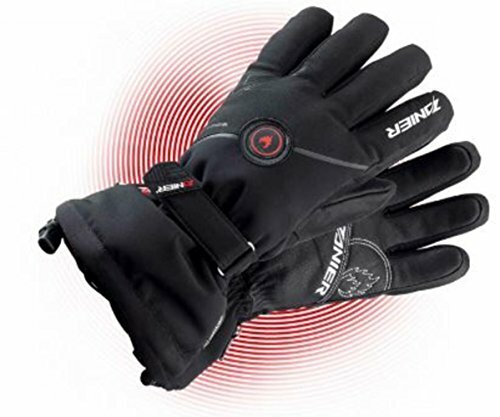 With heated gloves for skiing your hands will be warm and comfortable and you will be able to perform your best while skiing in the blistering cold. Heated gloves use an advanced battery cell technology with which they are able to self-heat, providing warmth to your hands in the cold weather. They also prevent water and snow from getting to your hands. 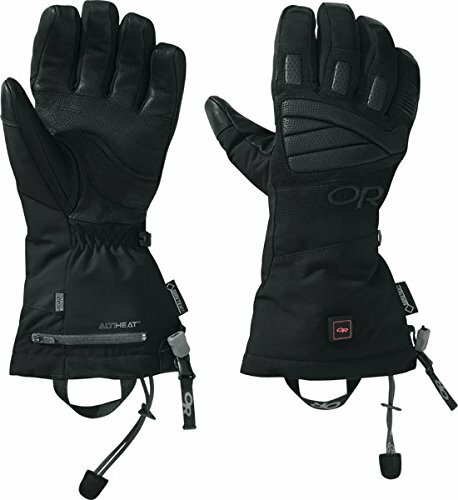 Do Heated Gloves Really Work? Yes, they do! Although heated gloves can be found in a variety of types and sizes, they all work the same way. Thin wires are woven throughout the inside of the glove and a battery is connected to them. Each glove has its own battery which is fitted into a pocket on the outside of the glove. When you turn on the battery, the electrical current from the battery is passed through those wires heating them up. The generated heat depends on the amount of current the battery passes through the wires, which depends on the battery setting. 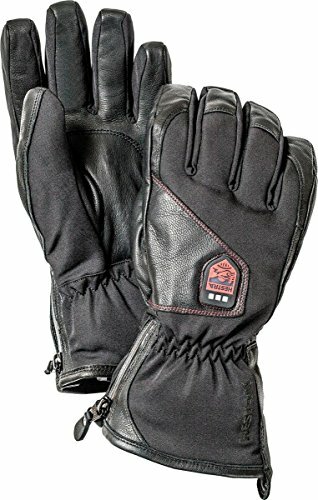 No matter if you need them for work, winter sports, riding your motorcycle or just to keep your hands warm, heated gloves are an amazing item that anyone should have. What Are The Best Heated Gloves For Skiing? Finding the best-heated ski gloves can be quite difficult if you do not know what to look for. We have selected some of the top choices in this category and by reading the following heated gloves for skiing reviews you will make an informed choice that will be worth it. These gloves got many starts and appreciation for their durability, functionality and long life dor the battery. They got numerous awards and prizes from outdoor gear magazines as well. The Outdoor Research Lucent gloves have been designed for winter sports, such as skiing, snowboarding, sledding and many more. Their outer shell is created from GoreTex, a very longlasting, waterproof and windproof synthetic material, which is still breathable. 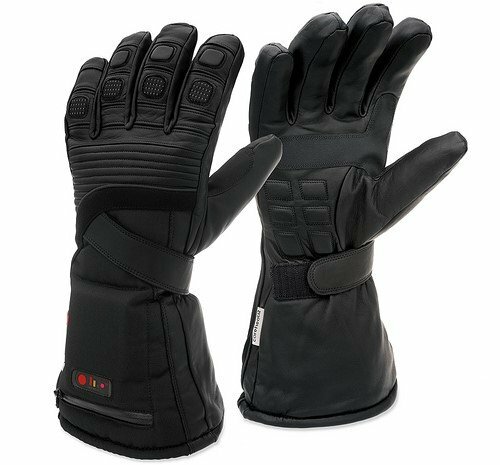 The soft goat leather strips placed on the palms help with the grip and the extra insulation keeps the hands warm and comfortable. The lining is made of warm fleece, which can wick away moisture and dry quickly. Each glove has a lithium-ion battery and each comes in a zippered compartment. The sizing chart offered by the company is pretty accurate, therefore it should not be difficult to find the right size for you. The gloves can extend high on the forearm to keep the heat in and cover the gap which usually forms between the gloves and the coat sleeve. The Outdoor Research Lucent gloves have three settings: low, medium, and high. Some users said that the low one was not efficient enough. The user’s manual says that the battery should last for 8 hours on low, 5 on medium and about 2 hours on high. This means that you might need to get extra batteries if you plan to stay in the cold for a long time. 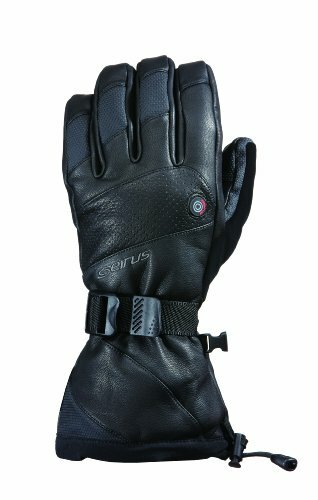 The heating system is the innovative Outdoor Research ALTI heat which gives 5.5 watts of power to each glove. The gloves also have the widest heated surface area, which translates in more contact with your hands. On the downside, the only color they can be found is black and their construction was considered somehow stiff by some users. Some customers complained that the heat was more concentrated at the top of the hand and that not much reached to the palms or the fingers. These best heated ski gloves from Seirus are very functional, offer exceptional quality and are flawlessly designed to protect your hands from cold. The gloves are made from top-quality leather and have the DryHand waterproof insert. The gloves are fitted with the new 300 Ultra battery, which is a lightweight, highly efficient lithium-ion battery. You have three separate heating settings to choose from: low, medium and high. The battery lasts between 4 and 12 hours depending on which setting you use. To make the gloves more effective, the company integrated the flexible fusion panels, as well as 280g Heatlock hollow-core insulation. Seirus Hellfire also comes with the Toughtek plus Soundtouch technology which allows you to use a touchscreen device with the gloves on. On the downside, the price for these gloves is quite high and a few customers said that the construction of the gloves is bulky. The Lenz heated gloves will keep your hands warm even at the lowest temperatures, thanks to the three different heat settings. On the lowest setting, the battery will give you up to 10 hours of coverage. The pulsating heat technology manages to evenly distribute heat towards the fingers promoting better blood circulation. Lenz has also taught about the sweaty hands problem and included in these gloves a dry, breathable lining. The exterior is waterproof and can handle moderate rain or snow. Although the gloves are thick, they are still very flexible. They have a 4-way stretch material, with polyester being the predominant one of the outer shell. The leather lines the palm of the glove offering more gripping ability and protects against the wear and tear. The fleece interior adds comfort and warmth and the adjustable strap at the wrist, made of leather, gives the possibility to tuck the gloves into the sleeves. Lenz 3.0 are durable heated gloves and what sets them apart from the competition is the inclusion of various charger outlets which make them ideal for traveling. On the downside, the gloves come only in one color, and they are not touchscreen compatible. 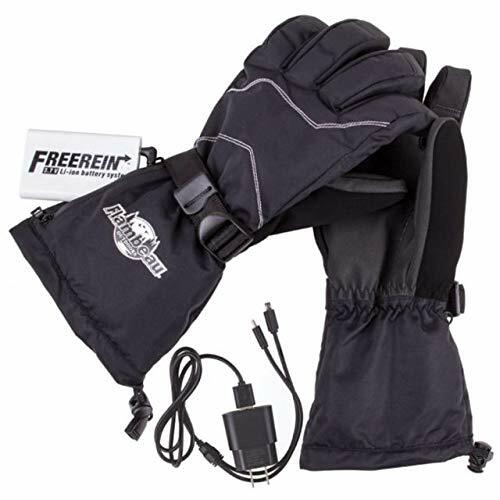 Although these electric gloves are designed for riding motorcycles in cold weather, they can also be used for skiing if you buy a lithium-ion battery, temperature regulator, and charger. The outside of the gloves is made from premium leather and the inside is lined with lightweight Thinsulate insulation and fleece. The waterproof but breathable membrane will wick away moisture. These gloves can keep your hands warm for 1 hour on high, 2.5 hours on medium, and 4 hours on low and the maximum temperature is 135 degrees F. Because the company used the Microwire heating technology, the small heating fibers are spread throughout the entire glove to provide all-over warming. 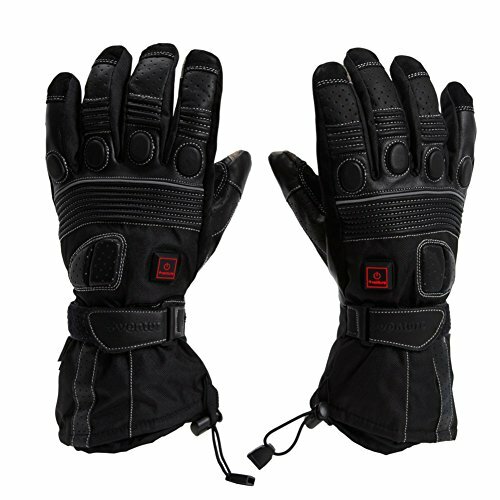 Gerbing’s T5 Hybrid heated gloves are waterproof, durable and have a nice construction. Some customers complained that even though the cuff is large enough to fit over the jacket sleeves, it also let the rain get inside the glove. Other clients said that the fingers are too long. 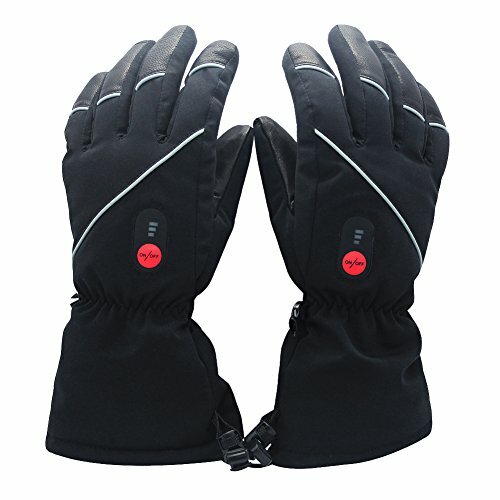 These heated gloves for skiing are specially designed to provide low voltage heat to warm up your hands in cold climates. The gloves are breathable, waterproofed and will keep your hands dry and warm while skiing. They are also functional and durable. Some customers said that the functionality, size and mechanics of the gloves are not what the customer promises. The size difference was an issue for many clients. The design can limit the dexterity and the heating mechanism had some issue too. 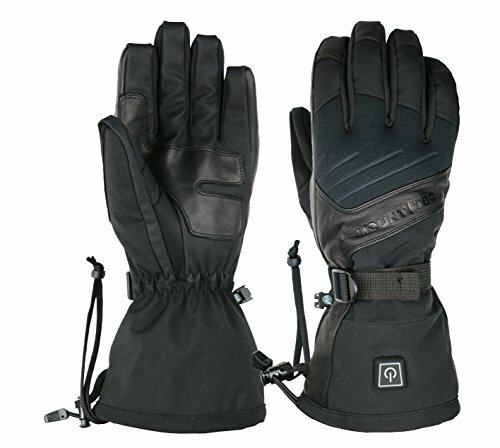 These heated gloves are so versatile that you can successfully use them for skiing, paragliding and other activities. 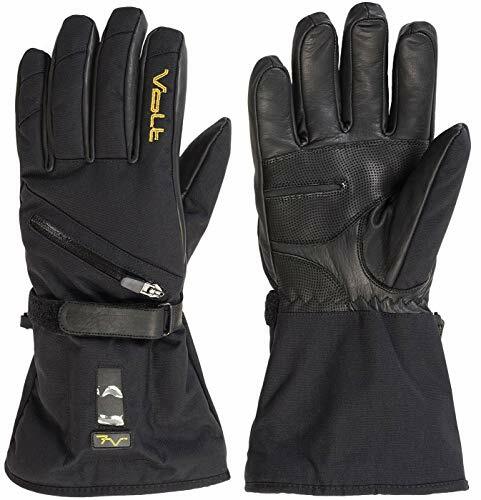 The shell of the gloves is goatskin with a GoreTex breathable membrane, which is waterproof, and the four-way stretch definitely helps with flexibility, as well as movement. The Primaloft insulation will hold warmth in when it’s freezing cold and at high altitudes. The gloves have long, adjustable cuffs that can fit over your winter coat and the edges of the fingers have been reinforced to prevent tearing. The index finger and the thumb have touch screen compatible fingertips, which is a rare feature at heated gloves. The lithium-ion batteries are very light and shock resistant. Each glove comes with a pocket for extra batteries. These batteries offer the longest heating time seen at heated gloves, with a lifetime of 10 hours when using only one battery pack. According to the company, the gloves can heat up to 144°F on high, 113° on medium, and 99° on low and the “Impulse Control” microprocessor will keep the blood circulating in your fingertips. The overall design and construction of the gloves are very high-quality and the tech features are top notch. Some customers complained that they did not get warm enough and some wanted the gloves to have a wrist strap to prevent losing them. On the downside, the batteries need 7 hours to charge, which is longer than most other similar batteries. The Swedish company has designed this pair of gloves to keep warm for longer periods of time, but at the same time be functional for outdoor sports and activities. The Hestra Power is a perfect choice for heated ski gloves. They are comfortable and have heating elements arranged in coils to distribute the heat evenly. The outer shell of the gloves is a mix of synthetic leather and cowhide leather. The gloves also have the Hestra proprietary Quallofill insulation, as well as a CZone waterproof insert in the lining. The grip is maximized by the goat leather which covers the palm. There are three heat settings and the batteries last between 8-10 hours on low, 4-5 hours on medium, and 2 hours on high. The gloves come with lithium-ion batteries, chargers, as well as international adapters. The Hestra Power heated gloves are protected against electronic failures for two years, starting with the purchase date. The buttons to adjust the temperature are very accessible in the top right area of the hand. Some clients complained that the gloves do not have a large cuff to fit over winter coats and that they are tight and difficult to get on and off. Since there are no heating coils in the thumbs, some customers said that their thumbs got colder than their other fingers. These heating gloves come with the charger and external battery separately, but with a temperature controller for each of the gloves. The heating elements have been put around the palm of the glove, so the heat will radiate from the outside to the inside. The gloves come with a Dintex membrane, which is waterproof and placed over a nylon and Nappa leather shell. They are touchscreen compatible, are lined with fleece and have 100-gram Thinsulate insulation. Venture Heat 12V heated gloves are not bulky and the gel pad that was built in helps give the glove a soft feel. The heat-up time is very short, heating your hands in under a minute. These are some durable and well-constructed gloves, with easy-to-use heating controls. Due to the very thin fibers of the heating elements, the Venture Heat 12V gloves are very comfortable, and they run true to size. On the downside, some customers complained that they got an electric shock in their fingers when the gloves got wet. Some other people said that the gloves are not entirely waterproof and that they get wet even after a short time in the rain. What sets these heated gloves apart from the others is the placement of the heating elements which are on the palm, extending through the fingers, and not on the top of the glove. The heating elements are thin and flexible, made from carbon fiber, so you won’t feel them. The shell of the gloves is Oxford nylon and the lining is waterproof and breathable polyester. The gloves have an adjustable wrist strap and cuff cinch to help the heat stay in and 100 grams of insulation. The non-slip palm is perfect for skiing and the reinforced thumb will keep your hands safer. Each glove has one 3.7-volt lithium–ion battery and the temperature control is right on the battery. The company claims that the batteries can be charged 1000 times and that they last up to 4 hours on low and 3 hours on high. What sets these gloves apart from the others is the fact that they are machine washable. The lightweight design of the gloves makes them much more conducive to activities like skiing than some of the bulkier brands. On the downside, some customers complained that the battery life is very short and that there are only two heat settings available. Some other clients said that the gloves kept their hands from going numb but did not keep them warm. Mount Tec might be the best heated gloves for skiing for you. They are made with far-infrared micro-composite fibre, as well as with 3M Scotchgard goatskin leather, which is waterproof, and neoprene. The inner compartment is made with Primaloft insulation with a reflective silver lining, as well as an absorbent brushed tricot lining which has anti-microbial properties. The gloves are powered by a rechargeable lithium battery fitted with a 3-level power switch, as well as a LED indicator light. The gloves come with a charger and there is also a gauntlet cuff with cuff leash to help secure it to the hand. You can choose one of the five available sizes. One of the best parts about these gloves is that they are touchscreen compatible and are among the best heated gloves thanks to their high-tech features. On the downside, some customers complained that the battery life does not hold on for long after being recharged, while others said that the gloves did not offer enough protection in extremely cold conditions. All the gloves presented in this article are great choices if you want top quality heated ski gloves. If you are still unsure which ones would best fit your needs, we can help you with more information. Here is what you should pay attention to when choosing a pair of heated ski gloves. 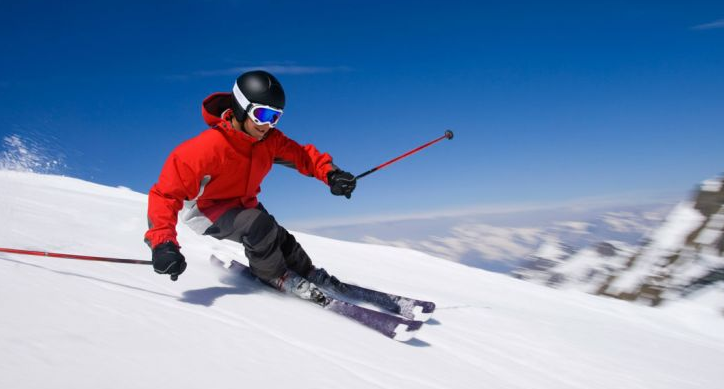 The first step is to think about what features you need the heated ski gloves to have. Think about all the activities you will use the gloves for. If you do not only use them for ski, but for other winter sports too, then you might want to choose a company that makes an extensive winter sports gear. If you have bad circulation, you should look for some gloves that have heating elements all the way down the fingers. If you know that you are rough on the gloves, there are several brands that provide extended warranties. You will find not only a variety of brands out there, but also a variety of prices. The rule ‘you get what you pay for’, also applies in this case. As the price goes up, so does the quality of the gloves and the features they offer. But some of the gloves have some features that might not be important to you. In this case, do not be scared to go with a less expensive option, but don’t go for the cheapest one. Look carefully at how they are constructed. It may actually be more economical to pay a little extra for a better pair that will last for more than one season. Like any other gloves, the heated ski gloves have to perfectly fit your hands. If they are too large the heating elements will not have enough contact with your skin to keep your hands warm. If they are too small, they can get quite uncomfortable and difficult to use them. Although most companies offer sizing charts, it would be a better idea to also check the customer’s feedback on this topic. The battery life varies from one brand to another. Think how much time you will spend in the cold. If you are going to use them for less than two hours, you do not need to worry about the battery life. If you want to spend more time than this, then you may want to consider a pair of electric gloves with a long-lasting battery or buying extra batteries. You should also know how long it takes for the batteries to charge. Some have a quick-charging time, while other can take 8 or more hours. You will find this information in the user manual or on the company’s website. Now you have all the information you need to find the perfect heated ski gloves for you. Just pay attention to what you really need, read some customer reviews on the product you want and what features it offers. Glove.ly is a participant in the Amazon Services LLC Associates Program, an affiliate advertising program designed to provide a means for sites to earn advertising fees by advertising and linking to Amazon.com. Additionally, Glove.ly participates in various other affiliate programs, and we sometimes get a commission through purchases made through our links.